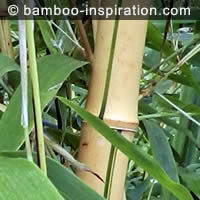 Phyllostachys vivax Aureocaulis has an amazing visual appearance having a lovely tone of yellow culms randomly striped with green with spotted specked culm sheaths. The green stripes on the canes are sometimes narrow, sometimes wide, and sometimes multiple that almost look like a barcode, they are truly random! 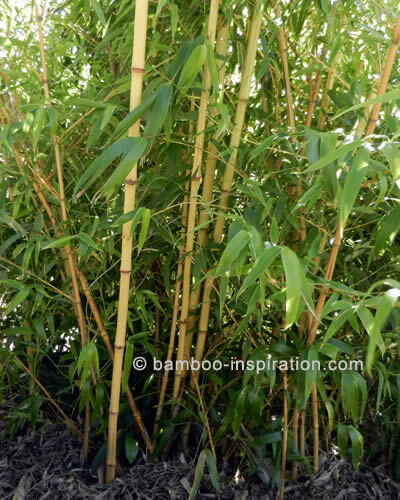 If you want a big spectacular bamboo, and you have the space for it to grow to full maturity, this is the one that will achieve the desired impact. This bamboo looks stunning if planted somewhere where there will also be a reflection such as near water. 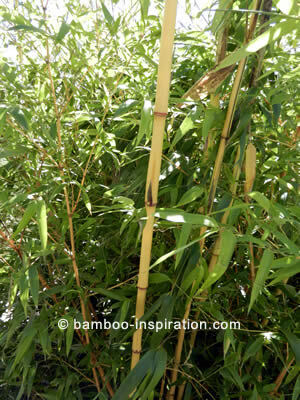 Phyllostachys vivax f. aureocaulis is a vigorous growing bamboo that you will just love to watch producing new shoots and culms in the summer months. The leaves will generally be around 13cm long by 2.5cm wide (5 by 1 inches). 1m-3m (3.3ft - 10ft) over ten years producing an open growth but can be clumping. Spread can be quite unpredictable though not very often causing invasive issues provided you are aware it is a big plant and give it up to 3m (10ft) for mature growth. In a cold garden it may just remain in a tight clump but still produce plenty of culms. Hardy to -20C (-4F), new shoots should have protection from hard frost if seen early in the growing season; ground planting provides better root protection so container plants need to be sheltered during extreme winters. Phyllostachys vivax including green with yellow stripes.